Kata No.1 is Ippon-me in Japanese. The first kata starts from jodan no kamae. I find it very interesting because we all learn chudan first in kendo. I may be able to explain why after the introduction of the meaning of the kata No.1. In Kata No.1, uchitachi take a step forwards to cut down shitachi in half from the top of his/her head. But shitachi avoids the cut by taking a step backwards onto the left foot and lifting both hands up, and cutting down uchitachi in half from the top of the head. Uchitachi cuts in to cut shitachi in half. Uchitachi does this at the risk of his/her life. Shitachi avoids this cut by moving slightly and end his/her life. There are only two cuts involved in this kata but this shows what exactly kendo is about. "Execute a cut at the risk of our life and live at the risk of our life". This kata tells us that there is a very thin layer between life and death. There are more. We actually end our opponent's life in Kata No.1. This is considered as a very immature stage of our skill because we take a person's life. Firstly, we have to win/live but it is not the goal of kendo. This is the only entrance. The explanation is what I learned when I was in New Zealand. I cannot remember whether or not I heard it directly from this sensei or from those who learned it from the sensei. The sensei is INOUE Yoshihiko sensei (8th dan) from Shizuoka Prefecture. I will use his teachings to explain the meaning of Kata No.1, No.2 and No.3. So now we know that Kata No.1 reminds us what kendo is and also an entry level of kendo. So please keep that in mind. Uchitachi takes hidari-jodan and shitachi takes migi-jodan. Uchitachi executes a men cut stepping onto the right foot. Shitachi avoids the men cut by taking a step backwards onto the left foot and lifting his/her hands up (slightly backwards). 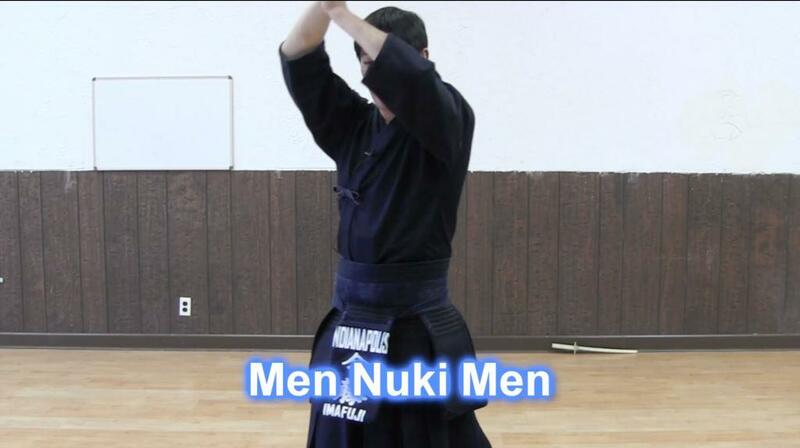 The name of the technique is men-nuki-men. Shitachi takes a step forwards onto the right foot and strikes uchitachi's men. Uchitachi takes a little step backwards onto the left foot. Shitachi drops his/her swords down to the bridge of the uchitachi's nose when uchitachi takes a little step backwards. Uchitachi takes another little step backwards. a. As uchitachi takes the second little step backwards (mentioned in 8), shitachi slowly extends his/her arms as if he/she pushing uchitachi back with the kensaki. b. Shitachi lift his/her sword up above his/her head while taking a step forwards onto the left foot to take hidari-jodan. This is zanshin. Uchitachi starts moving his/her sword up and lifts his/her head straight up. Shitachi starts moving his/her sword down and moves his/her left foot backwards. Both uchitachi and shitachi take chudan. Both lower their swords turning own sword to the right so the kensaki of your swords is approximately in front of your right knee. Take five small steps backwards onto the left foot. After the five steps, take chudan and ready for Kata No.2. Uchitachi's men cut is a cut that he/she put everything in it. In other words, he/she risks his/her own life. The cut is executed to cut shitachi in half including shitachi's hands and the grip of his/her sword. That means uchitachi is determined to execute this cut. Uchitachi must know the feeling of this. Since the cut misses shitachi, it goes all the way down. The blade of the sword is straight. Some people turn the sword but it is not right. Keep the sword straight after the cut. Uchitachi should not lower the body as cutting down. In other words, do not bend the knees when cutting down. Keep the knees straight. When executing their cut, both uchitachi and shitachi should snap up their back foot. Do not leave the back foot behind when striking. This is the same as kendo. We do not leave our back foot behind after we strike.